Just when you thought you had seen everything in the Copenhagen bicycle culture, the Sperm Bullitt appears on the cycle tracks of the city. Yes. The Sperm Bullitt. This is brilliant. If you're cycling around Copenhagen, keep your eyes peeled for this bike. Nordisk Cryobank (European Sperm Bank)is one of Europe's leading sperm banks and the company was looking at environmentally-friendly alternatives to how they could transport their sperm samples to the fertility clinics around Greater Copenhagen. The company's CEO, Peter Bower, says, "The first idea was how we could deliver to the fertility clinics in a C02-friendly way. Shortly afterwards followed the idea of a custom-designed bike with a cooling system. Now, six months later, we can cycle around the city on our sperm cell bike." The text on the side reads Become a Sperm Donor in Danish. The bike is more than just a rolling billboard for the company aimed at increasing awareness of the need for donors to help childless children around the world. Inside the head of the giant sperm cell is a cooler compartment designed so that the metal containers with sperm donations can fit snugly inside and be kept cold. CEO Peter Bower rides the bike himself around town and he is constantly stopped by curious passersby who want to take photos of it or ask questions about the unique design. 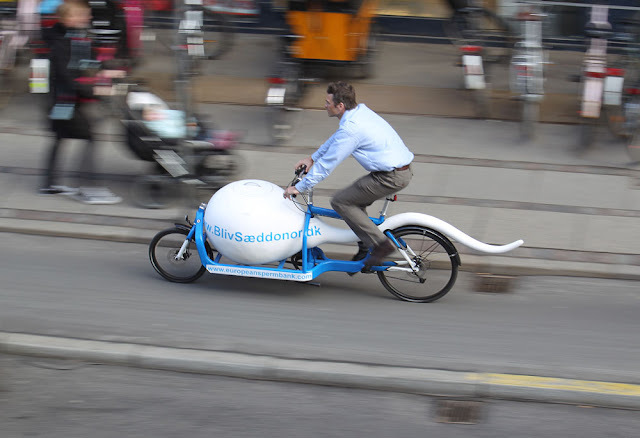 "We're always looking for new donors so it's a fine bonus that the Sperm Cell Bike gets peoples attention. ", says Peter Bower. 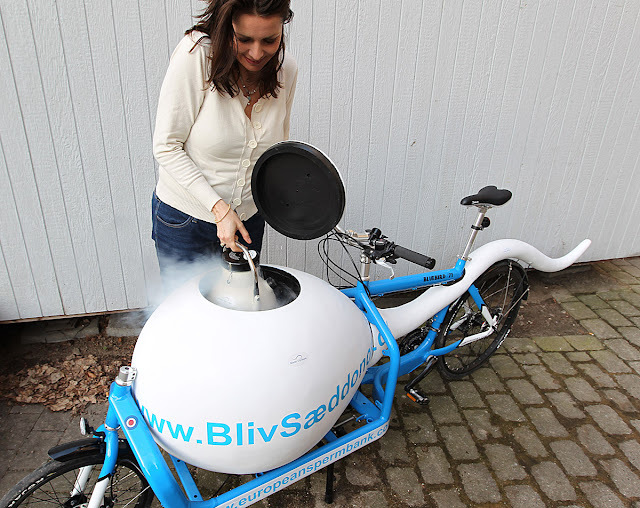 With the tail, the bike is 2.9 metres long and fully-loaded with... um... sperm... it weighs 50 kg. About the same as my cargo bike with two kids and a bag of groceries. An Aside from Copenhagenize... Why a Bullitt? - The Cocktail Delivery Bullitt. - The Karaoke Bullitt in Berlin. - The Newborn-Baby Transport Bullitt. - The Bike Repair Bullitt. - The Childrens Bedroom Bullitt. - The Nike Shoebox Bullitt. - The Summer Wading Pool Bullitt. - The Windmill and Solar Bullitt. - The Santa's Sleigh Bullitt. - The Daddy's Sleigh Bullitt. - The Stereo Bullitt from Klara Geist. - Still awaiting documentation (detailed and photographic please) of the Stripper Pole Bullitt in Dublin.